Boost Oxygen is manufactured in the same way as medical oxygen and consists of 95% pure oxygen with added essential oil aromas. All ingredients are 100% natural. 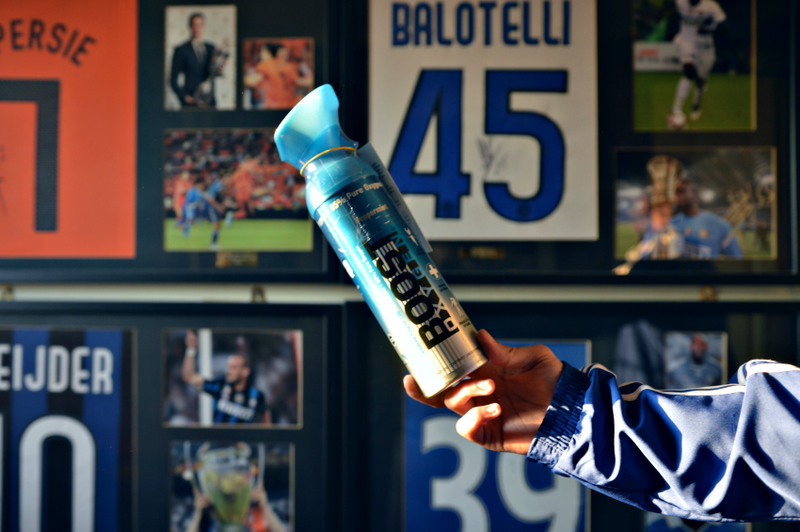 Our 6 and 9 litre cans are lightweight and easy to use with an ergonomic mask designed and patented by Boost Oxygen to provide a convenient apparatus that can be operated by using only one hand. According to the World Anti-Doping Association (WADA), supplemental oxygen is not considered a banned substance. All aromas can be used for sports performance as pure oxygen is the main active component, however interestingly; research shows that the aroma of peppermint can also boost sports performance and endurance. Studies can be viewed on our 'research' page. Originally affiliated with hiking and altitude training, Boost Oxygen is now been utilised by a vast array of sports including the likes of NFL, NHL, MLB, NBA, NCAA Arena Football League, and the American Hockey League. The Atlanta Falcons were the first pro-team to swap oxygen masks for Boost Oxygen canisters on the side-lines. In the UK we're heavily affiliated with the British Superbike Series. James Ellison, Jake Dixon, Danny Buchan and James Rispoli all breathe Boost Oxygen as they find it incredibly beneficial for performance and especially recovery. The most important part of using oxygen for performance is to 'oxygen load' before any strenuous activity for top physical and mental performance. When the body is experiencing extreme physical or emotional stress (surges of adrenaline and cortisol) it metabolises oxygen at an alarming rate which results in fatigue. Bodies emit more carbon dioxide during a strenuous event than the intake of oxygen which causes muscle fatigue and cramping due to the build-up of lactic acid. We recommend breathing Boost Oxygen right up until the event itself such as a can beginning an hour before and then another can as close to a match/training event as possible followed by a can on completion to aid recovery. The brain is the most oxygen hungry organ of the body requiring 20% of the body's oxygen. Even a small dip in oxygen as a result of a strenuous event, jet lag or poor air quality will result in mental fatigue. Research shows that just a few minutes of breathing supplemental oxygen improves concentration, memory and reaction time. Breathing Boost Oxygen results in a fantastic mental clarity and increased concentration/focus necessary to push through an event and achieve peak performance!